The Medical Herbman Cafe Project was one of the most inspiring landscape interventions we saw at the Niigata Art Triennial. Placed next to the school that had been closed less than 20 years after opening, the Medical Herbman Cafe Project consists of two elements: a mobile cafe that folds up into a container that fits on the back of a truck, and a herb garden planted in the shape of a person. The whole project is meant to be portable and sustainable. The garden is organized so that the plants are grown along the body part that are most helped by each herb. The cafe serves over 20 varieties of herbal teas and cookies. I tried oubako tea and azami (thistle) cookie. The aesthetics of the cafe is recycled wood and rustic chic, with one room serving food and another providing seating and event space. Small plants were growing in white gardening gloves. The Medical Herbman Cafe Project is powerful because it goes beyond a momentary appreciation of nature for city tourists, and promotes a healing connection between plants and people, countryside and city. I had mixed feelings that the Niigata Art Triennial benefits from the over-abundance of abandoned property in the countryside, and provides tourists and locals with a brief experience of rural experience and tourist commerce. If the Obuse building restoration shows the relevance of old buildings and agricultural traditions from chestnuts to sake, the Medical Herbman Cafe Project suggest that rural knowledge of herbs has a place in the daily life of our urbanized world. It would be cool to see Medical Herbman Cafe Project set up in a city, perhaps using a school yard, land temporarily empty during development, or a public park like Shinjuku Goen or Yoyogi. The menu below and the photo of the cafe above come from the Medical Herbman Cafe Project website. 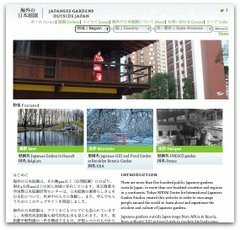 Although the site text is mostly in Japanese, the design and images will appeal to non-Japanese readers, too.